A Digital Imaging Story - Selfie is Oxford's Word of the Year! Among a range of competitors, from binge-watching to Bitcoin, and from showrooming to twerking, "selfie" has won out as the Oxford Dictionary's "word of the year", according to coverage in The Guardian. The noun describes a self-shot digital portrait, typically from a smartphone camera. The Google Trends report above, shows that while "selfie" may not be the most popular of the terms based on headlines, it's coming on strong! 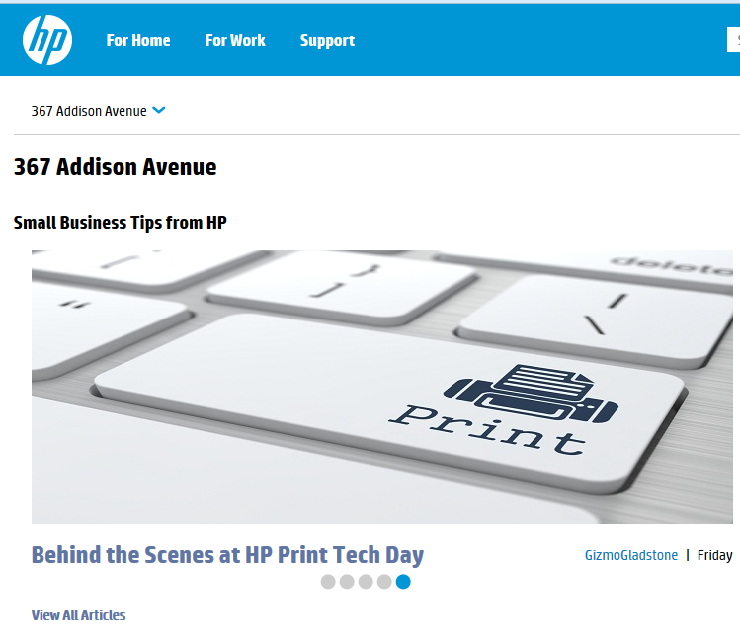 I am still processing all the interesting information gleaned from the HP Print Tech Days which took place in Boise this week, and am confident my article pipeline is well stocked for the coming weeks and months. The Power of Social Media - HP LaserJet edition! The one-millionth LaserJet was donated to the Gutenberg Museum in Germany, some 25 years ago. This photo came my way via a Social Media connection. First off, I believe I have adequate excuses for being addicted to social media. One, as a part-time blogger/journalist/analyst, I use Twitter and other sources as news-gathering tools. Two, as a part-time business professor, I need to stay abreast of one of the biggest disruptors in the history of marketing, and an important element of that knowledge is personal, hands-on experience with the various platforms. OK, with that out of the way, I am also just plain hooked! And part of that comes from social media's unique abilities to enable connections. Whether it's with becoming re-acquainted across the miles with long-ago friends and workmates, or expanding my reach locally with people of different demographic status but who share common interests in expression and reaching out, or even the occasional "brush with greatness", social media offers "never-before" opportunities. A recent series of events confirmed to me, once again, an example of this reach. 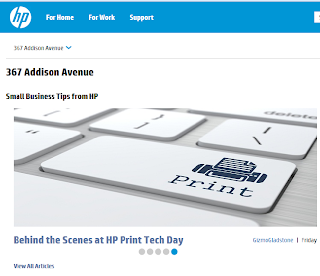 At HP's Print Tech Days this week, we got the scoop that the company had shipped 200 million LaserJet printers. 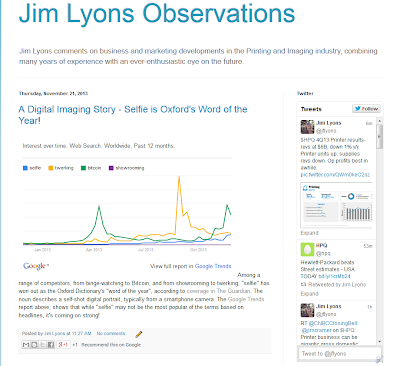 In addition to blogging about it here (see http://jimlyonsobservations.blogspot.mx/2013/11/hp-ships-200-millionth-laserjet.html), I also tweeted and updated my LinkedIn status to include the news. And shortly thereafter, long-time-no-talk long-ago business colleague, Reinhard Anton (@reinhardanton) replied back via LinkedIn that, as our LaserJet product manager in the late 1980s, managed the donation of the one-millionth LaserJet unit to the Gutenberg Museum in Mainz, Germany and even provided the photo commemorating the gift, included above. A fun, great memory that would not have happened without Social Media! The information is flying fast and furious at HP's Boise site, at the kickoff of the annual #HPPrintDay, as to be expected. But in addition to the myriad features and benefits, one big news announcement - 200 million LaserJet printers shipped. The release includes a great timeline of the product's history, going back to 1984. Three months ago, I posted about social media in our industry, promising to at least irregularly promote "best practices" (at least as I observe) them. 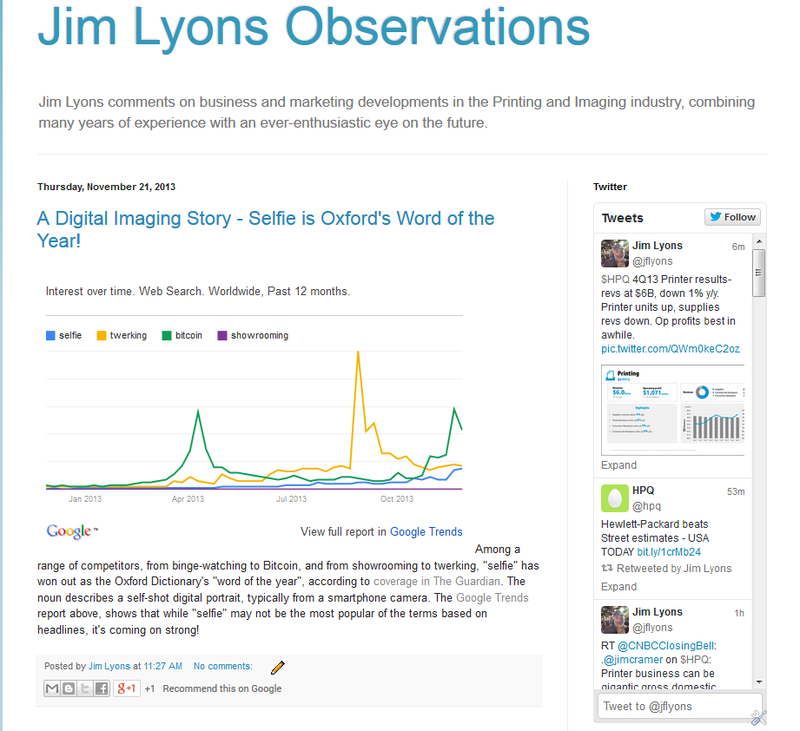 I am offering a second entry in my nominations for "Social Media Stars" in printing and imaging with this installment. 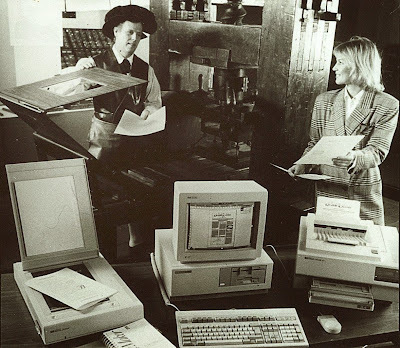 This is a relatively new blog, consolidating the efforts of many others which have preceded it, including a printing-focused blog hosted by my fellow HP alum (and then LaserJet marketing vice president) Vince Ferraro - and where I was known to pop up occaisonally as a guest contributor. I found one post, still archived by HP, from 2007, where I provided an update from the Lyra Symposium occurring in January of that year (and continuing its annual run through 2012). The exact date of that post happened to be Febuary 2nd - hmmm. Groundhog Day! Here's a cut-and-paste from the above post, with links to some of HP's other social media outposts. And stay tuned for more about #HPPrintDay right here, as well! Use and follow the hashtag #HPPrintDay on Twitter, Facebook and Instagram. Follow @HP_SmallBiz and @HP_Print Twitter handles for updates. Follow our HP Instagram page, where you can check out photos and videos from the event. Not all my links/references made it into the final copy but thought I would include them here, as (more or less) footnotes.